Woke up to sub 50 degree temps and the wonderfully crisp scent of fall, which means it’s definitely time for pumpkin season! Back when we ate dairy, pumpkin cheesecake was my all-time favorite Thanksgiving dessert; it’s usually much sweeter and less vegetal than a traditional pumpkin pie, and my favorite version starts with a buttery graham cracker crust, which, let’s be honest, is the best part of any cheesecake. 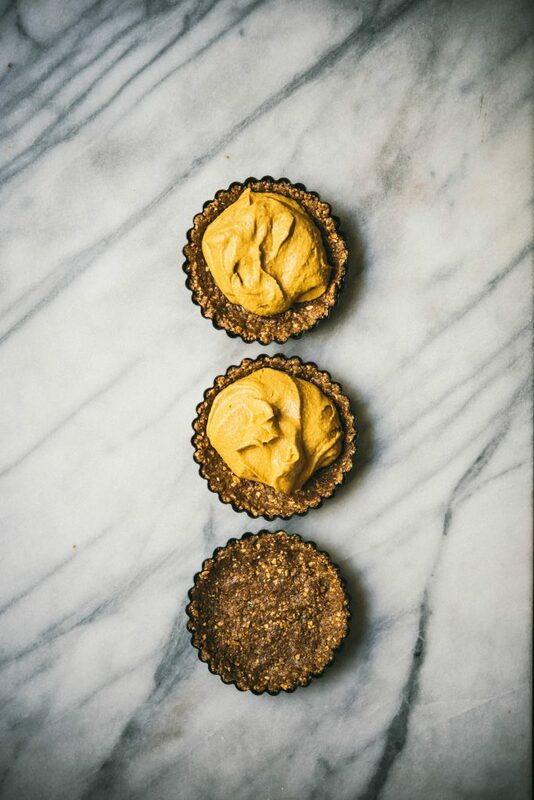 Since going dairy free, we’ve tried a few different recipes for vegan pumpkin cheesecake, but nearly every recipe starts with a crust made from nuts and dates, which quite honestly just doesn’t live up to my expectations for a decadent pumpkin cheesecake. Since most vegan cheesecake fillings are made with cashews or other nuts, I find that a nut-heavy crust is a bit overkill, and I often feel uncomfortably full after just a few bites. 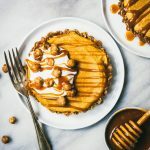 Although this crust recipe does contain pecans, the real star is a bit unexpected: crunchy chickpeas – Saffron Road Salted Caramel Crunchy Chickpeas, to be exact! They provide that satisfyingly salty/sweet crunch that’s missing in many traditional vegan cheesecake crust recipes, and anything salted caramel flavored is a win in our books. Give these a try this fall and let people guess the secret ingredient – we always love to see the shocked look on our family’s face when we tell them they’ve been scarfing down chickpeas in a dessert! 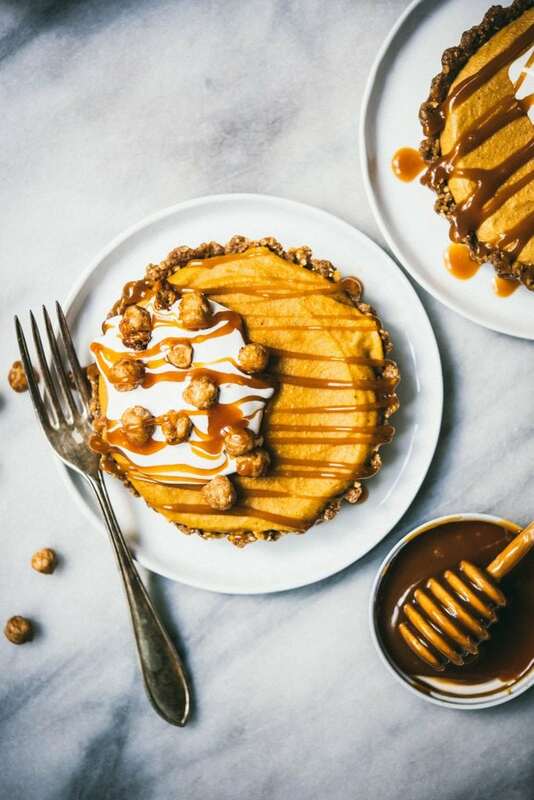 Salted caramel crunchy chickpeas make for the perfect base for this creamy vegan pumpkin cheesecake! Add pecans and crunchy chickpeas to food processor. Pulse until you have a crumbly mixture. Add in cinnamon, agave, and cashew butter and process until mixture sticks together when pressed between fingers. Press crust into bottom and sides of 4 1/2 inch tart pan and put in freezer while making filling. 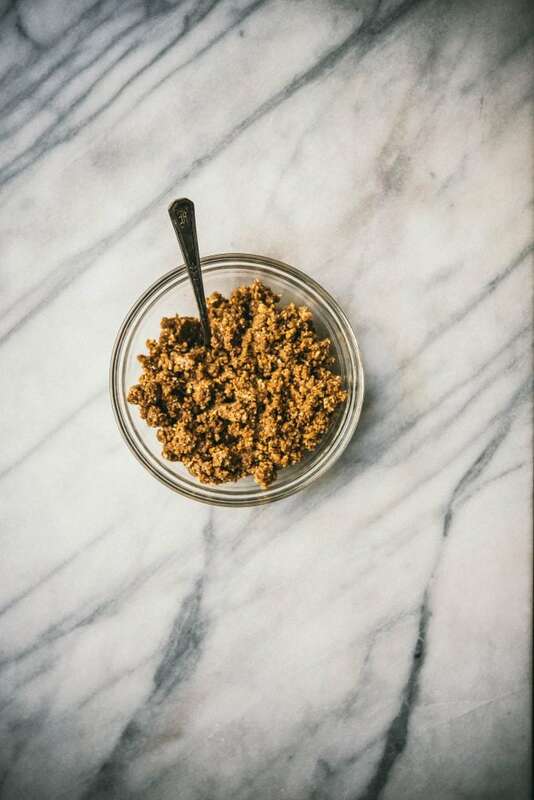 Blend cashews, pumpkin, maple syrup, vanilla, lemon juice, pumpkin pie spice and sea salt. Blend until smooth and creamy. Slowly drizzle melted coconut oil in and blend until it is well incorporated. Pour filling into crust and smooth with spatula. Freeze for 1-2 hours or until filling is solidified. Soften at room temp for 10 min before serving. 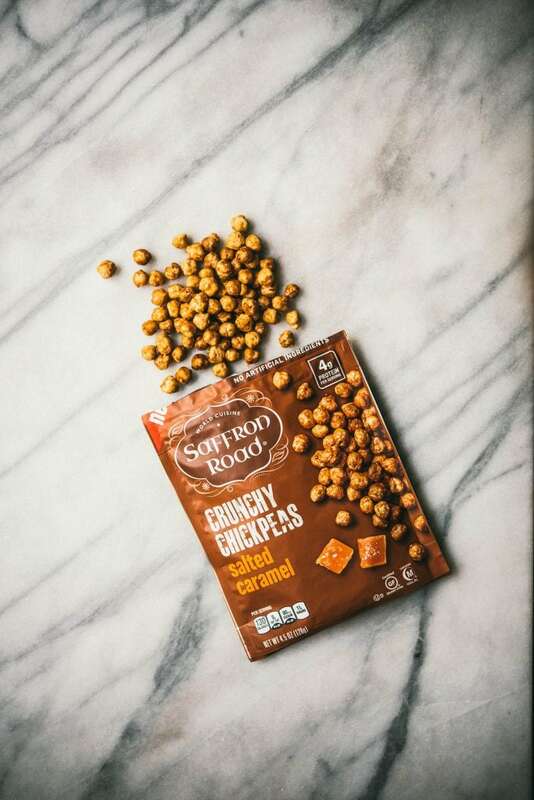 Serve with coconut whipped cream, vegan caramel and more Saffron Road Salted Caramel Crunchy Chickpeas!